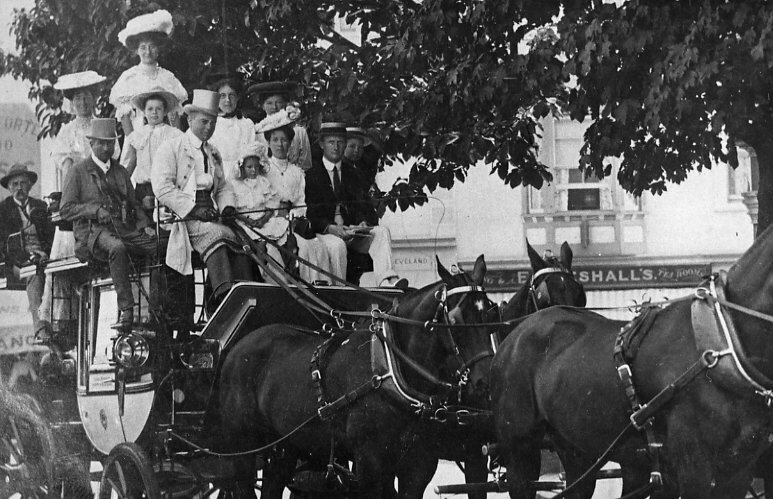 Photograph of a postcard of a group of people on a horse and trap, Isle of Wight, 1907. “On cold nights, boys counted it a privilege to assemble round the glowing forge listening to the ringing music and watching the operation of these sturdy sons of Vulcan.“ P. Birtchnell. In the days of horse-drawn transport, the work of the blacksmith –‘ the king of trades’ – was all important. 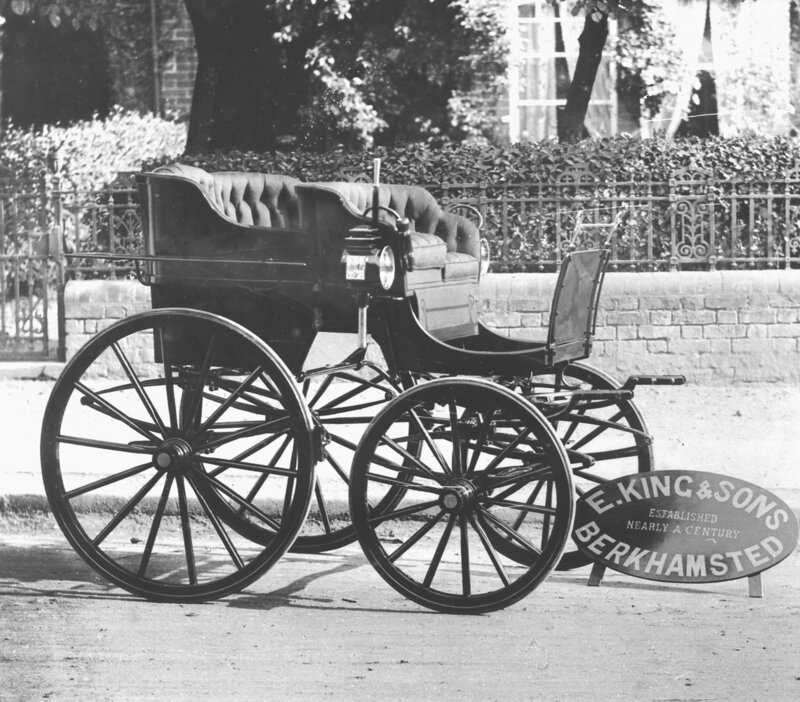 Stage coaches became the fastest mode of transport in the 18th century. It is no coincidence that the mainly appalling state of Britain’s roads improved at the same time. Turnpike Trusts were set up locally to maintain the road surfaces, often little more than muddy tracks that became impassable in extreme weather. By 1836, the journey from Tring to London took three hours. Berkhamsted was situated on the main coaching routes to London and the Midlands and, by 1824, there were two passenger coaches travelling to London at 7am and 8am. The Sparrows Herne Turnpike Trust was formed in 1762 and given the power to “amend, widen, alter and keep in repair” a 27 mile stretch of road from Bushey to Aylesbury via Watford, Boxmoor, Berkhamsted and Tring. There were four tollgates, including one at Newgate (between Berkhamsted and Tring). As well as stimulating the trade at local inns, the constant stream of coach traffic also led to a great increase in the demand for coaching – related tradesmen – blacksmiths, coach builders, farriers, saddlers and wheelwrights. The advent of the canal had little impact on coaching, mainly because the latter concentrated on transporting people and perishable goods. However, the arrival of the railway in the 1840s had an immediate effect. Suddenly, people had access to a quicker and cheaper method of transportation. Toll rates halved by the end of the 1850s and the Sparrows Herne Turnpike Trust itself came to an end in 1873. 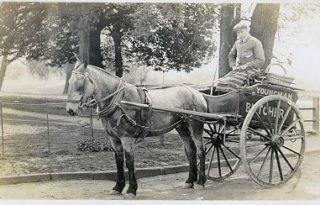 Despite this, many of the coaching-related trades continued well into the middle of the 20th century, as local deliveries continued to be carried by horse and cart. Vans and lorries eventually forced this old method of transport from the road and today only the blacksmith and farrier survive as rather specialised occupations.